This week was all funerals all the time. Talking about funeral work feels strange, even though it is part of my job. I worry I sound insensitive (or worse, like a gold-digger), when I have to discuss death and invoices in the same conversation. 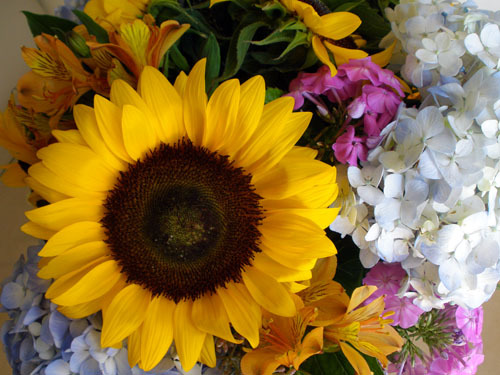 My husband, and even some of my clients, point out that someone needs to provide the flowers for a funeral. I try to reconcile my conflicting biz lady feelings by making funeral arrangements as personal as possible. 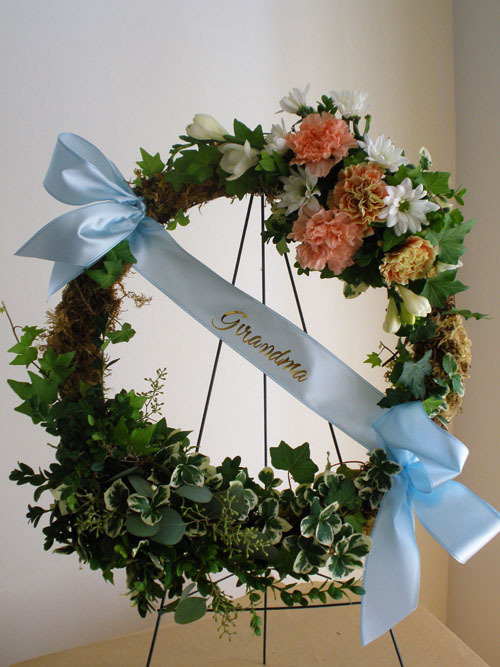 This week I created memorial arrangements for two ladies who passed away in their nineties, and were being honoured by children, grandchildren, great grandchildren, extended family and friends. Their tastes, and the way their families chose to mark their lives, could not have been more different. 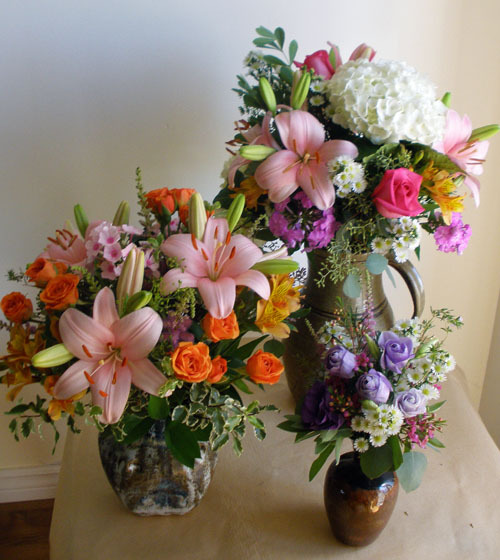 On Monday I delivered garden style vase arrangements for a celebration of life and brunch at the Yacht Club. The family had requested bright oranges, pinks, and purples. Their mother had hated anthuriums and carnations. She had assembled a wonderful collection of pottery throughout her life, and had an amazing perennial garden, so I arranged with the daughter to pick up some vases and take some cuttings. 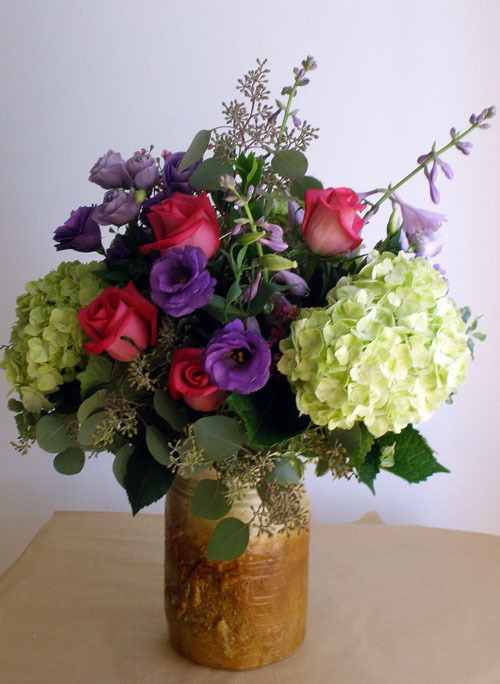 I used the vases, greenery, phlox, astilbe and hosta blooms a to make the arrangements as ‘her’ as possible. The second family traditionally held their wakes, services, and interments at a local funeral home and family cemetery plot. 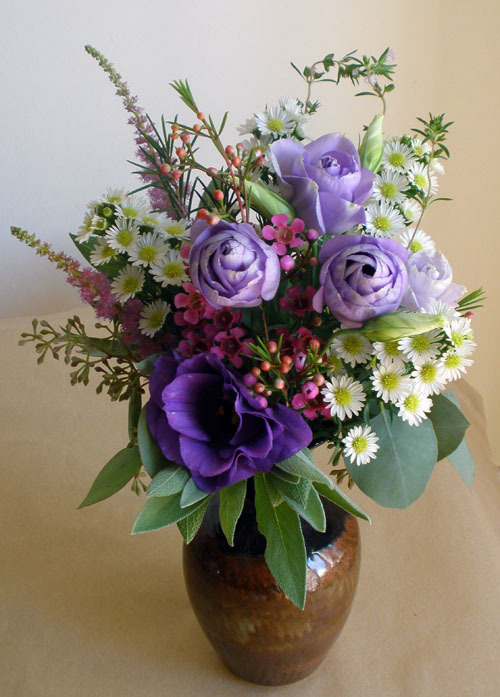 They requested subdued colours and longer lasting cuts such as carnations and daisies- their mother had always found cut flowers a little impractical. Her favourite colour was blue, but I worried that hydrangeas might collapse or run out of water between the wake Tuesday and the service and interment on Wednesday. I decided to use the hydrangea in a vase arrangement, to ensure a continuous water supply, and then used blue ribbon for the script. 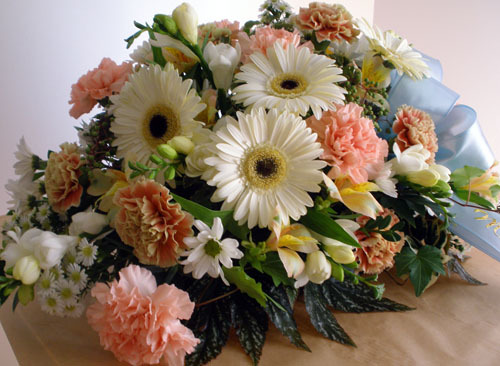 Because I wanted everything to look fresh and lovely throughout the two days, I really leaned on ‘workhorse’ flowers such as gerberas, alstroemeria, daisies, and carnations. I tried to add interest, texture and scent with mosses, viburnum, ivy, begonia foliage and freesia. I knew the family preferred plants to cut flowers, so was able to suggest a planter basket with some perennials for friends who also wished to send a tribute. It sounds beyond shallow to obsess about colours, ribbons, and the exact drape of a begonia leaf against the backdrop of someone dying, and a family having to come to terms with their grief. But I guess working hard to contribute our best, and to make the family as pleased as possible with their sendoff, is all we ‘bystanders’ can really do. Thinking of anyone who is missing a loved one this weekend.